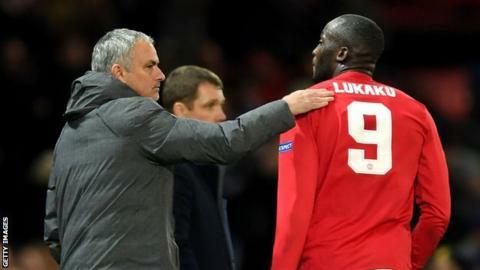 Manchester United's Romelu Lukaku could be the most important player on the pitch in Sunday's Manchester derby, says ex-England player Owen Hargreaves. After joining United from Everton for £75m in the summer, Lukaku hit seven goals in his first eight league games but has scored only twice since. Hargreaves, who played for both Manchester clubs, believes another element of his game will be crucial. "United will need to get out of defence through Lukaku," he said. "Everyone said before he came to the club that his hold-up play was not good enough for a top, top player but in the past few weeks it has been much better. "United need that so they can get players up the pitch. He could be the most important player in the game." Is stopping Sane & Sterling key to derby success? A must-win Manchester derby for United? United are second in the Premier League, eight points behind their city rivals. Pep Guardiola's side boast the most prolific attack in England's top flight, having scored 46 goals in 15 games. United, meanwhile, have the best defence. They have conceded just nine goals, with only one of those at Old Trafford. Jose Mourinho's side adopted a cautious approach in their 0-0 draw at Liverpool in October, and Hargreaves believes they will have to be more adventurous against City if they are to retain hopes of winning the title. "A draw is good for City. How many points are they going to drop over the rest of the season? They've already won the league so the goal for them is to make some noise in the Champions League. "It is more a must-win game for United. If City win, the title race is over." Is Pep in for the long run? Guardiola is in his second season as City manager - and his first was mixed. He won his first 10 matches in charge before a streak of six games without a win - the worst run of his managerial career - as City finished third. But the Spaniard has revitalised the squad, and Hargreaves expects him to be City manager for years to come. He said: "Manchester City were building towards Pep for a long time and I think some of the players that went there before were his mould - the likes of Kevin de Bruyne and Raheem Sterling. "I would say Pep, with how young the squad is in terms of the players he is signing, that's a long-term project. "It is hard to think where he could go. He has done Barcelona and Bayern Munich, he isn't going to Real Madrid, so there is only really Paris St-Germain or a national team. I think he will be there for a long time." Hargreaves does not think the same can be said for Mourinho's spell at Old Trafford. "If he wins the league, he could fancy a different challenge, or if doesn't work out and United are not in a position where they are pushing City then you could imagine him going after a few years." A good game to be without Pogba? United will be without midfielder Paul Pogba on Sunday as he serves the first game of a three-match suspension following his sending-off at Arsenal. The France international has been hugely influential for the Red Devils this season, but Hargreaves feels United may thrive without him. He said: "For Pogba, you would have to argue the weakest part of the game is defending. As much as he is irreplaceable, for this one-off game Mourinho might not mind having someone more defensive in. "Pogba may help with that out ball and the ability to play a precise pass, but in terms of the defensive structure and being disciplined I don't think anything will change for Mourinho, he will demand they defend as a group, break and play on the counter. "City will dominate the game but Watford and Arsenal had control of their games against United and were beaten comfortably." Who makes your Manchester derby XI? Read more on Manchester derby: Who makes your Man Utd-Man City XI?